In A.M. Shah’s chapter book, a young boy discovers that zombies have invaded his town. In the middle of the night, Johnny awakens to scratching noises. A green shadow in his closet convinces him a monster is lurking, but the next morning, his mother allays his fears when she opens the door to reveal a green bathrobe. Still, Johnny remains uneasy — and his apprehension grows when he boards the school bus, driven by grumpy Mrs. Eisenstein, only to find it empty—except for one friend, Alex, who is in a trance. Once at school, Alex snaps out of his stupor, and he and Johnny wander the deserted school grounds looking for an explanation. Horrified, they encounter their first zombie, see the basketball coach getting attacked behind a bush, and stumble onto a gym full of zombies. Soon, the boys and Mrs. Eisenstein take off in the bus, trying to flee the zombies. Shah has created solid characters in Johnny, Alex and the quirky Mrs. Eisenstein, and he delivers terrific, vivid and imaginative descriptions of them (“The dark black circles around the eye sockets looked like the depths of outer space”). The author throws some thrilling curve balls their way bound to keep readers on edge. Unfortunately, the story also has some flaws: The final showdown scene is prolonged, lessening its impact. And the narrative includes a few jarring inconsistencies (Johnny’s mom is identified as “Mom” and “Momma,” then suddenly is called “Janie”; a zombie is almost nose-to-nose with Johnny, but seems farther away when it starts to move toward him, etc.). Finally, at 100 pages and without illustrations, the story might have difficultly sustaining the attention of its target audience. With its vivid descriptions, it’s positively crying out for art. The story’s end has a twist that’s sure to raise a final goosebump. 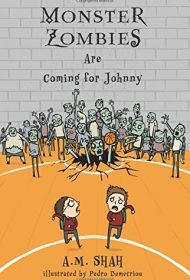 With some editing and ample illustrations, it could prove to be an exciting read for young zombie lovers.